I have had some holidays from my day job, so for the last few weeks I have been working pretty much full time on my Etsy shop. I signed up for a market in January and I wanted to have lots of stock, so I started sewing rompers. 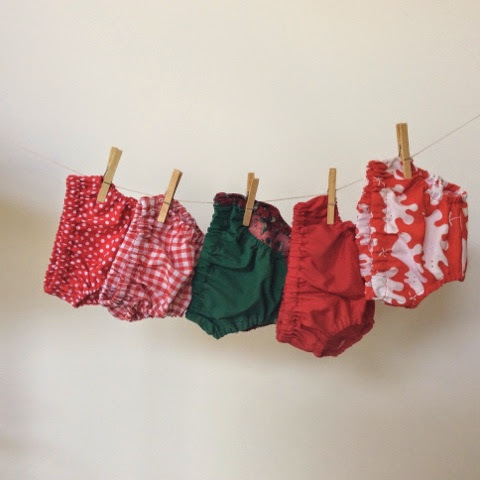 2015 is the year of working smarter, not harder, so I organised myself in advance to create a batch of 20 rompers. First, I pulled out my collection of vintage sheets and fabrics, and added a few which were left over from various projects. I cut out all the rompers on my ironing board, while watching "firefly". To avoid confusion, I immediately pinned a label on each one with its size and how many more could be made from that fabric. 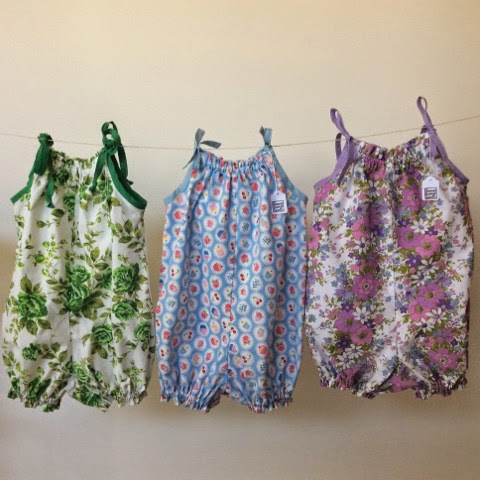 Then I spent several hours overlocking all of the rompers and then ironing all of them. Once that was done I started to work on one of them at a time. I sewed casings in matching thread, inserted elastic and finally added matching bias binding ties. I did all the red ones and then all the green ones, and so on in order to minimise time winding bobbins and changing thread etc. As soon as each one was finished, I snapped a photo and listed it in my shop, www.bananaorangeapple.com This slowed things down a little bit, but in a good way, because people kept buying rompers online! If there was a whole sheet, then I listed a quantity of three or four and let the customer choose what size they wanted when they checked out. They are selling well, and so far have gone to Mexico, Canada, Norway, USA, as well as Australia. Someone from Spain bought one then came back later and bought a second one! It makes me very happy thinking about my sewing ending up all around the world. 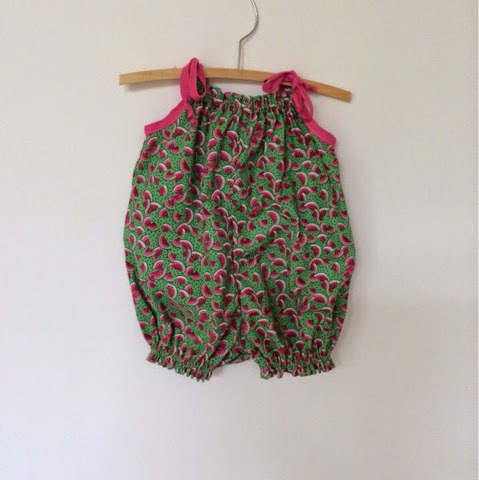 The pattern is from this Etsy shop, https://www.etsy.com/listing/157703815/pretty-baby-romper-pdf-sewing-pattern?ref=shop_home_active_9 but I altered it a bit to include elastic along the neckline and bias binding shoulder ties. It's really easy to sew and I highly recommend it. 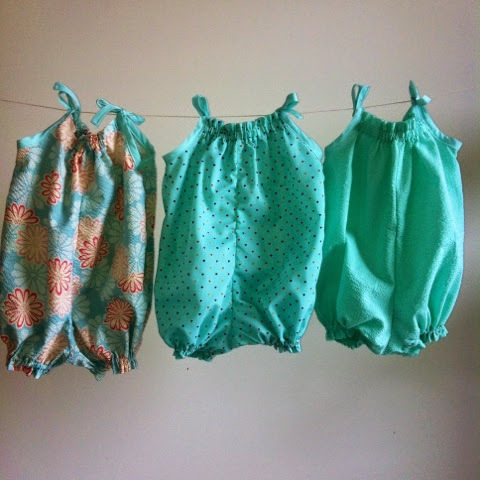 I also made a few nappy covers, since I realise boys need clothes too! I am looking out for a good boy romper pattern to use in the future. 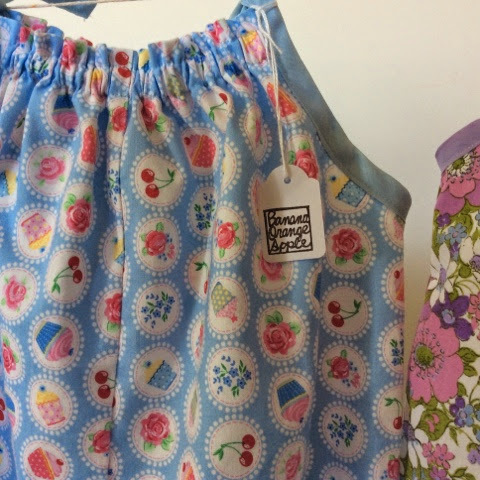 I also have plans afoot for a winter line of pinafores (or as they call them in the States - Jumpers) made from corduroy with cute appliques on the front and bright lining. It is lots of fun thinking up the appliques! I do intend to use the same streamlined sewing process to simplify things. I plan to use my new (to me) Elna press to put on the fusible web on the back of the appliques and avoid gumming up my iron. And I understand it's pretty cold over in North America so I hope I can get them in my shop soon. 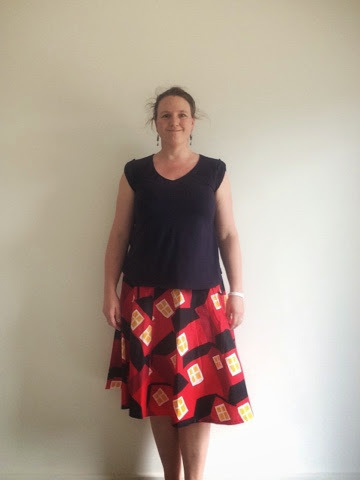 So I set off today on a mission to find some more sheets to cut up, since the rompers are still in production and I will need lots of fabric to line the winter pinafores. 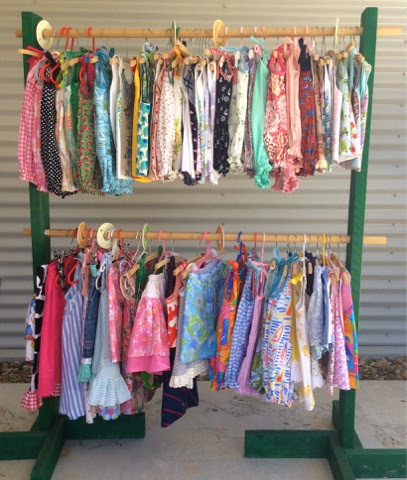 I visited five op-shops around town, but sadly there were no suitable sheets. I did come across some lovely seersucker in gelati colours, and some gorgeous chunky purple corduroy. This did not photograph very well, so you'll just have to take my word for it. 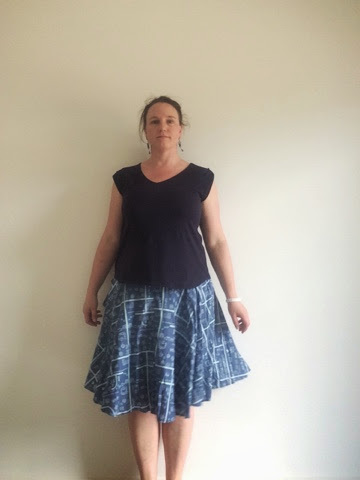 I also like to update my work wardrobe, so I found myself three skirts. They were more than I usually like to pay ($9 each!!!!) but I love them so much I had to have them. I took a photo for you, as well as a close up of the groovy fabrics. There is one with big houses. 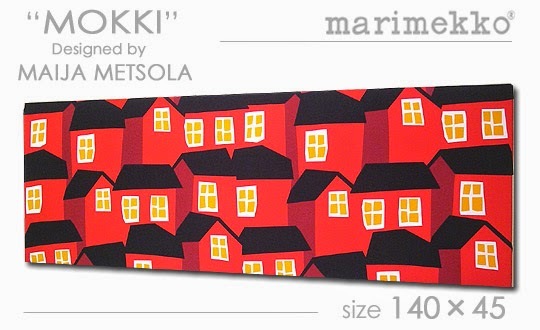 I was so excited when I got it home I noticed the selvage had been left in a- and the fabric is the famous Marimekko brand from Finland. Whacka-doo!! 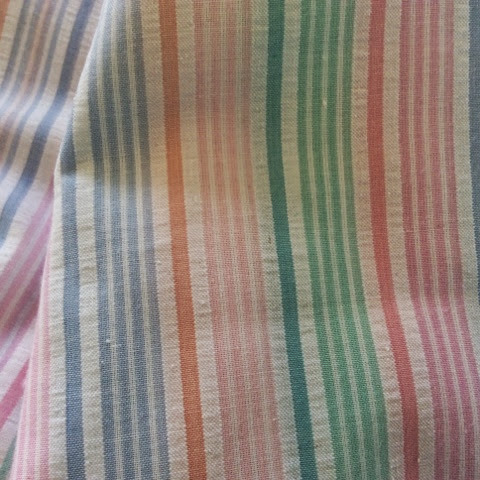 It was made in Darwin by Raw Cloth, I tried to find their website but I think it's just a brand that sells at the markets up there. It'll look great with my red sandals. 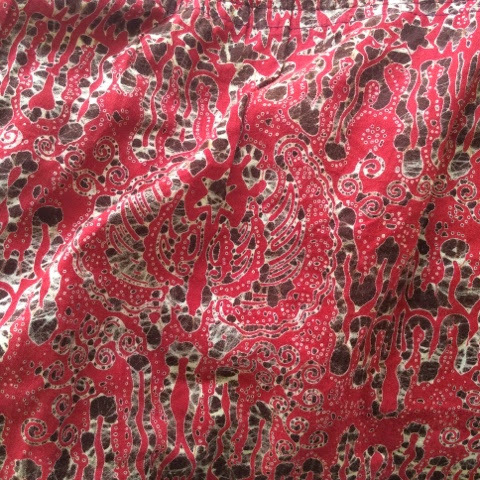 There was also a lovely fine cotton with red and brown batik - the fabric is silky like lawn. 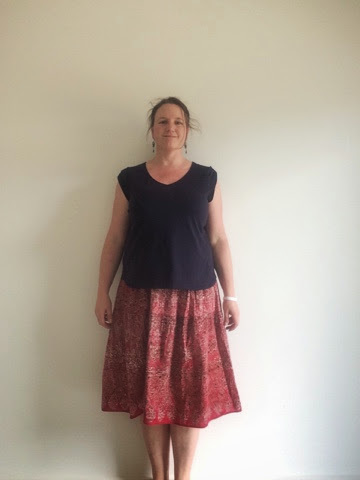 It has three tiers and the waist band is sewn directly onto elastic, so I think it is homemade. 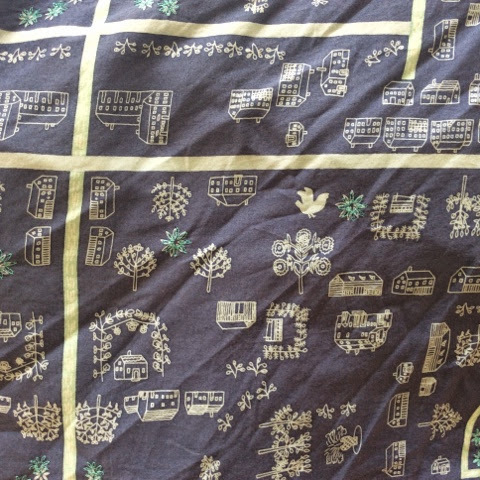 Finally, an amazingly cute blue skirt with a map print showing streets, houses and trees. Bits of it are embroidered in aqua thread. Your hair looks cute all floofy. I'm undecided which skirt I like best. Each one is awesome. 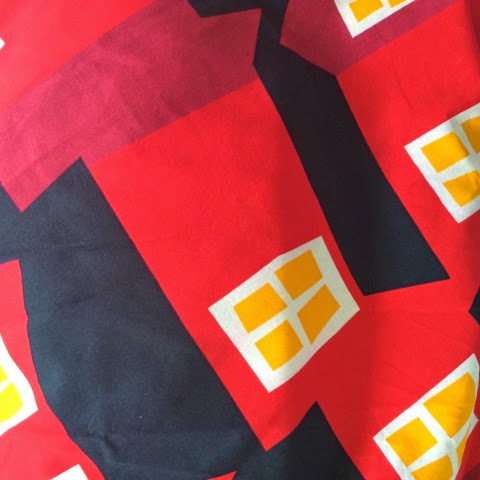 I am very partial to houses so if I only had $9.00, I'd have to buy the house skirt. 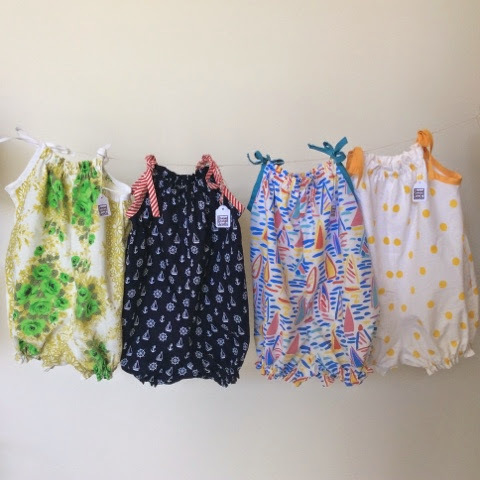 The rompers are adorable and I think your "factory piece work" style of manufacture is brilliant. I always think I'll do that but I'm too anxious to see a totally finished product immediately. Blog more - how about once a month for starters. Wow, you have been busy! And I love the skirts! I love your rompers! So sad that my granddaughter is past that kind of outfit! What a great set-up you have for cutting and organizing and sewing. I think you will get a lot done that way. Love your skirts too. I love to wear a flowy skirt on a hot humid day! We have a few more months to wait for that here! !